Every online business -for that matter, every business – has its strengths and weaknesses, and not surprisingly, the weaknesses are often common to many competitors in a niche. The business that will stand out above the others will usually be the one that has valuable strengths where the competitors are weakest. So, while it’s wise to concentrate on maintaining and growing your strengths, to be better than the “other guys”, that may not be enough to make you stand out. If you want to make an immediate impression, make your business shine where others are failing miserably. 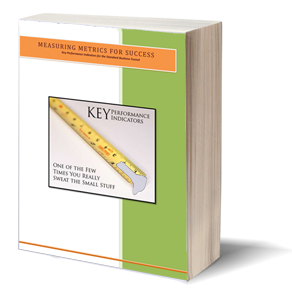 The first step is to identify the features or services that offer real value to users. That may sound simple, but it’s actually easy to miss golden opportunities when you’re too close to the subject. If a particular feature is particularly difficult, to the point that essentially nobody in the niche does it justice, it can be unconsciously discounted. Take a hard look at your offering, from the standpoint of a user, and put together an objective list of things you might like to see, from their standpoint. Don’t leave anything off the list just because you happen to know it’s not feasible or cost-effective. things that few or none of your competitors’ offerings provide, that users would like to have. When you find features, no matter how difficult to achieve, in that last group, you’ve found an opportunity. 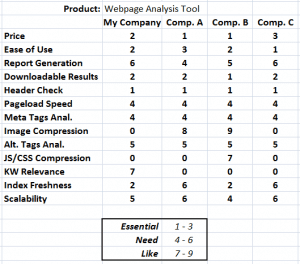 Now rate your competitors’ offerings in their ability to meet each of those features. If you’re looking at several different products or services, you’ll need to do a comparison for each. If it helps, you can quickly convert that information into a chart, to highlight the differences. Obviously, in this example, if you’re ranking poorly in the essential (1-3) items, you’re in trouble, and need to fix that ASAP. The ideal situation is finding an area in which none of you are providing something that users would find real value in, and then finding a way to do so. 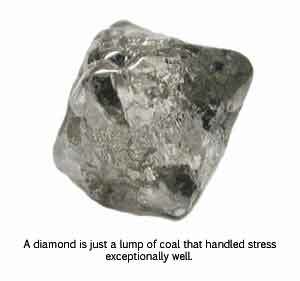 Now is the time to put on your thinking cap and bring enough pressure to bear to turn that lump of coal into a diamond. Focusing on those opportunities, put aside for now any difficulty in adding them to your offering – just look for the attractiveness of each to the users. To use a worn-out buzz-phrase, it’s time to think outside the box! You may be surprised to find some improvements that aren’t really so difficult, but have simply been missed because everyone has accepted the fact that nobody offers them. When you do, you just need to find a way to add them. Of course, when you do that, you can bet that it won’t be long before one of your competitors sees what you’ve done and decides to copy it. That’s okay, though, because you’ve accomplished two very important tasks. You’ve beaten them to the punch, and while they’re trying to catch up, you can be concentrating on your next innovation. And instead of you following them, scrambling to keep up, you’re now leading and setting the pace. It’s important to remember that each user will evaluate in his own mind the value your offering provides. It isn’t necessary to have the lowest price when you offer enough extra value to justify a higher cost. Both can do wonders for your bottom line, both short and long term. If you leverage those advantages properly, you can quickly build credibility and establish yourself as a leader in your niche. Got any tales of how you or someone you know made wine from vinegar? We’d love to hear about it in the comments.